Heightened security checks at airports could create a potential new target for terrorists, MPs have warned. A report by the Commons transport select committee said queues of hundreds of passengers in cramped spaces could become a security hazard. The committee recommended that reducing queues at security and speeding up check-in times should be a priority. The Department for Transport (DfT) said baggage security rules introduced last August met "a very real threat". The regulations resulted in disruption and delays and, although the situation has improved, passengers still face longer queues and increased waiting times. The warning comes a day after the government unveiled plans for a "unified border force" to boost the fight against terrorism. The "highly visible" uniformed force will bring together immigration and Customs officers, Prime Minister Gordon Brown told MPs. 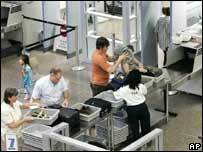 The committee heard from security experts that the resulting queues presented a significant security threat. Prof Alan Hatcher, principal of the International School for Security and Explosives Education, said that with bags not being searched when people entered a terminal he was concerned that queues of hundreds of people were effectively creating new targets. Committee chairman Gwyneth Dunwoody said: "Because of the necessary measures that are now in place, passengers are finding it more uncomfortable and time consuming to begin their journeys. "Security is the issue which currently has the most significant impact on passengers' experiences of air travel." The committee heard evidence before the recent suspected attack at Glasgow airport took place. Chris Goater, from the Airport Operators Association, said the view of experts is that the primary terrorist threat is from explosives getting onto aircraft. A DfT spokesman said: "The government has already launched a £1.5m advertising campaign in the national press to remind passengers to 'arrive prepared' and, where possible, is introducing changes to help make the security process quicker. "But we have to be satisfied that any changes will not compromise the safety of passengers." More robust systems are needed to stop the loss and mishandling of baggage.